BREAKING: Samsung Event On March 22nd = Samsung Galaxy S3 Reveal? While a lot of people were disappointed to hear that the Samsung Galaxy S3 would not be reveled at Mobile World Congress this month, it seems that they might not need to stay sad for long. 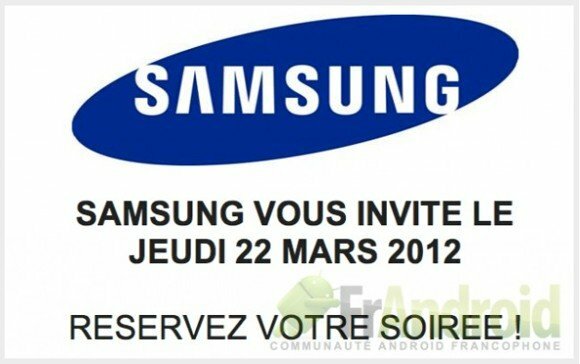 Samsung has now reportedly sent out invites for an exclusive event to take place in France, and will apparently happen next month on March 22nd. New York is normally where Samsung likes to make its product announcements, meaning that this could just be a rumor. But to be quite honest, the only new Samsung product that is really on the minds of mobile consumers right now is the Galaxy S3, and it just seems fitting that the announcement could take place at this event. Details are scarce right now,and we'll keep you updated as more details come in. If this IS indeed where the successor to the Samsung Galaxy S2 will make its debut, expect to see a beautiful device running Ice Cream Sandwich with a Super Amoled display, a monster quad core processor and a 12MP camera. What do you guys think? To anyone who's debating on getting a new phone in the next weeks: Is this possible launch date enough to make you wait until the March 22nd before making your purchase? GS2 was a hell of a phone. I dont blame you for waiting? What will you choose Eric? lol..I am debating between this phone, or to wait and see if Motorola and Google make the next Nexus phone. Still not sure. Samsung Galaxy S3 is sooooooooooooooo tempting.